Credit: Ottawa New Edinburgh Club Boathouse (ONEC). Photo courtesy of the ONEC. Ottawa New Edinburgh Club Boathouse (ONEC). Photo courtesy of the ONEC. The Ottawa New Edinburgh Club (ONEC) Boathouse is the site of one of the oldest boating clubs in Canada. The ONEC is known for its major contributions to, and development of, aquatic sports in Ontario. Construction began on the boathouse in 1914, according to the design of Ottawa architect C.P. Meredith. The two-storey wood-frame building combined boat storage with clubhouse facilities. The newly formed Ottawa New Edinburgh Canoe Club (ONECC) operated out of the building from the beginning. 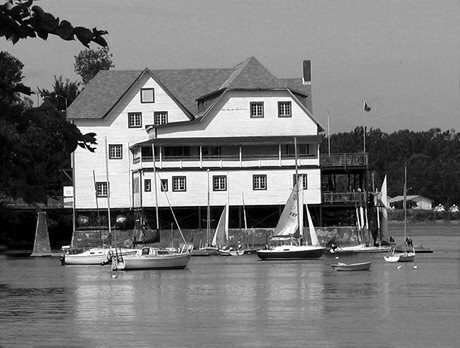 During the 1920s, the site experienced its golden years as membership boomed and the ONECC won championships, including the Canadian Canoeing Association Birks Cup. By the 1960s, sailing replaced canoeing as the more popular water activity. In the 1990s, this focus shifted to rowing. The club changed its name to the Ottawa New Edinburgh Club in 1965 and still operates out of the original boathouse. See historical photographs of the boathouse and canoeing along the Ottawa River at the Ottawa New Edinburgh Club website. Learn more about this heritage-designated building on the Canada’s Historic Places website. Read more about the history of the Ottawa New Edinburgh Club and its operations today.